Described by the Los Angeles Conservancy as “one of the most breathtaking Modern buildings ever designed,” and “a truly remarkable building that nearly defies description,” the Robert Frost Auditorium on the Culver City High School campus has undergone an extensive transformation, and will once again open its doors in September. The Culver City Education Foundation (CCEF) will hold a grand opening celebration on Saturday evening, September 29, from 6 – 9:30 pm. The event includes a party catered by Akasha, performances by CCUSD students and special guests inside the Frost, and a short documentary film about the making of the Frost. Information and tickets available at www.ccef4schools.org . Proceeds benefit arts for all CCUSD students. Tickets are $50 for general admission seating, $100 or reserved seating. Both ticket prices include all of the party festivities and show. Go to www.ccef4schools.org for tickets. The Frost was built in 1963 for the Culver City Unified School District (CCUSD). The architectural firm Flewelling and Moody designed it in the Organic Modern style with a ground-to-roof glass façade, brick exterior, and a distinctive reinforced concrete roof: it’s semi-circular and pleated, resembling a massive handheld fan when viewed from above. The roof is anchored to the ground by a single curved concrete leg arcing over the front entrance. Historians believe that the gingko tree, a beautiful deciduous tree with distinguishing fan-shaped leaves, was the inspiration for the roof. Futuristic for its time (the exterior was featured in Woody Allen’s 1973 sci-fi comedy Sleeper, and in the 1997 sci-fi thriller Gattaca) and continually heralded by architectural historians as one of the best-designed Modern structures, the building survived the 1994 Northridge Earthquake unscathed. But after continuous use since its opening, the facility has suffered from the ravages of time, and some ineffective and outdated internal systems. 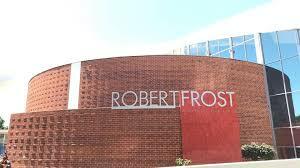 The ambitious renovation for the interior of the Frost included expanding the back-of-house spaces, adding a steel proscenium arch, handicapped access and new air conditioning, lighting and electrical systems. The remarkably thin 4-inch signature roof dictated that anything new had to be supported from the floor, which obliged the architects to devise unique solutions in their mission. Added elements include a 9000-pound sweeping steel proscenium arch, 40 feet high at its pinnacle. The arch spans the stage in order to support the new theatrical catwalks and lighting equipment necessary to transform the Frost from an auditorium to a full-fledged performing arts facility. Illuminated with multi-colored colored lights, the arch evokes the rainbow in The Wizard of Oz, which was filmed at MGM in Culver City in the 1930s. Other prominent design features include eight lightweight acoustic “sails” which double to silently circulate conditioned air to seating areas. Together, they act to create a more intimate experience for the performers and the audience, and enable the Frost to host a wide range of events from theatre of the spoken word to rock concerts. With 1200 seats, it is one of the largest theatre venues on the west side of Los Angeles, and is available for rent by outside organizations. My late folks — Charles and Jackie McCain — would be SO happy to read this news. Always committed to historic context, they advocated tirelessly for the preservation and upkeep of every neighborhood in their beloved Culver City. Congratulations on completion of a terrific project. Can’t wait to see it when we’re back in town for our FIFTIETH HIGH SCHOOL REUNION next month.